Happy St. Patrick’s Day! 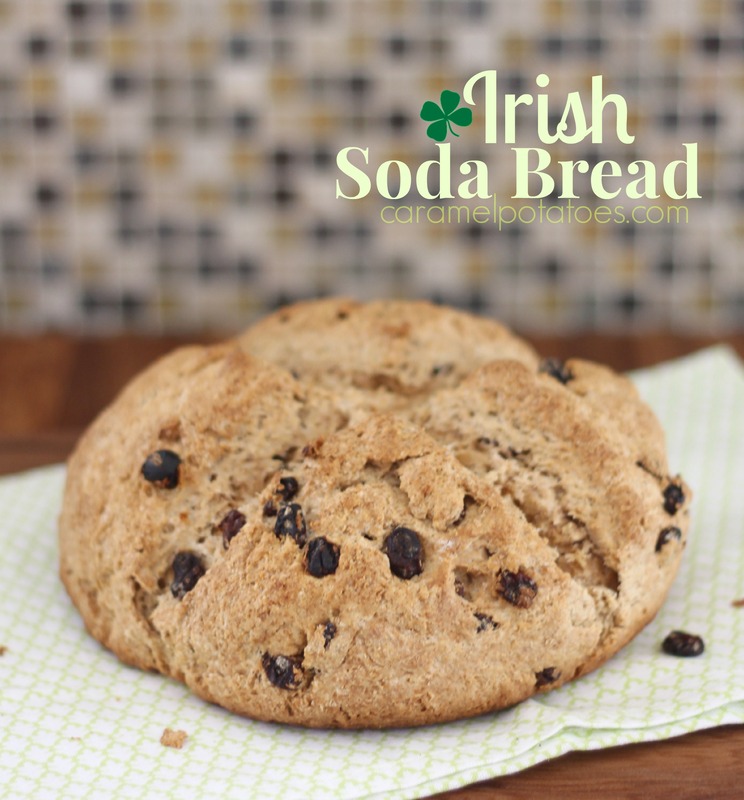 I may not be Irish, and I’m certainly no authority on Irish Soda Bread, but when I came across this slightly “Americanized” Irish Soda Bread with just the right amount of sweetness added to that yummy dense bread and craggy crust, I knew I found just the right recipe for me. 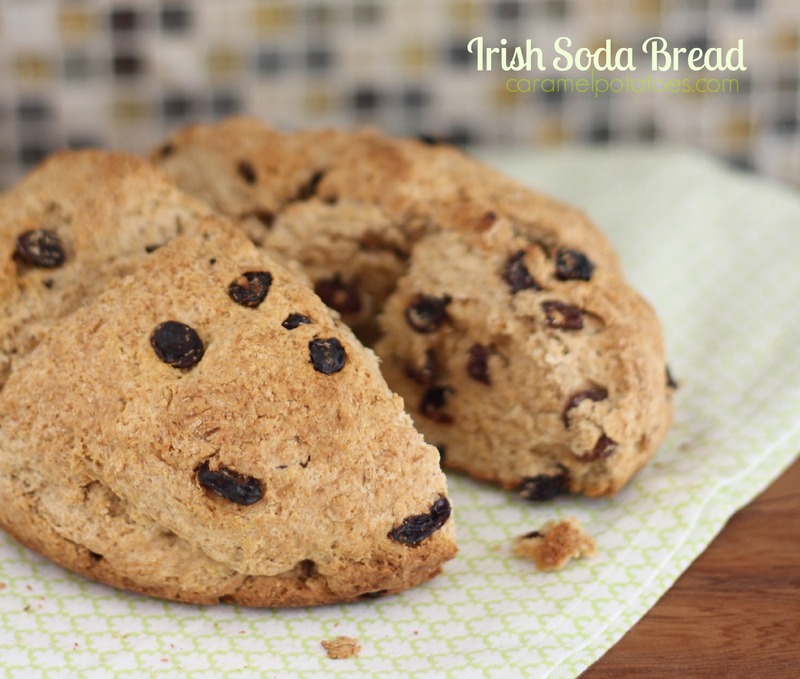 Traditional Irish Soda Bread has only wholemeal flour, soda, salt and buttermilk. Using a little lighter flour, plus the addition of butter, egg, and just a touch of sugar lightens it up a bit. 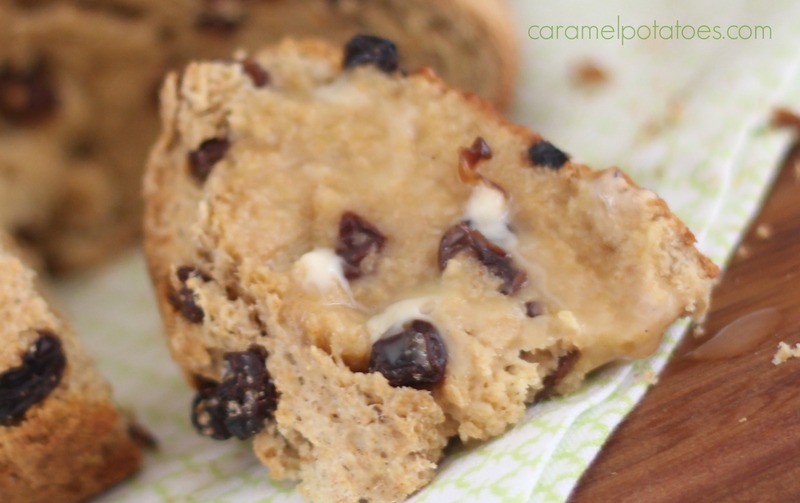 Adding raisins just make it a pure pleasure. This bread is fast and so easy to make- no kneading or hours for it to rise necessary. 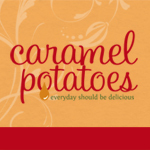 It goes perfectly with a hot bowl of stew, or try it with a little honey butter for breakfast! In a medium-sized mixing bowl, whisk together the flours, sugar, baking soda, and salt. Using a mixer, a pastry fork or blender, cut in the butter until it is evenly distributed and no large chunks remain. Stir in the raisins or currants. Knead the dough a couple of times to make sure it’s holding together, then shape it into a ball. Flatten the ball slightly, and place the loaf in a lightly greased 8- or 9-inch round cake pan, or pie pan; it won’t spread much, so the pan doesn’t have to be large. Use a sharp knife to cut a 1/2-inch deep cross, extending all the way to the edges, atop the loaf. Bake the bread for 45 to 55 minutes, until it’s golden brown and a cake tester inserted into the center comes out clean. Remove the bread from the oven, and brush the top with melted butter, if desired. Let the bread cool 10 minutes and then slice it up with a serrated knife and serve warm.